The workshop went really well. Bob was really good with the children and his illustrations of the children were amazing. This definitely caught everyone's attention and we all loved it. I can send you the quote for the newsletters about the WW1 work shop that was written by one of the Y6 teachers. 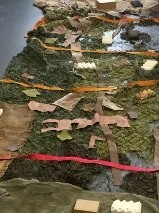 WW1 Tommys War- This was a highly informative workshop about WW1 and the soldiers who joined the army/ Children loved the opportunities and resources in the trench and mine activities.